Following on from the success of the Jubilee River clean-up on 2 February, we are seeking volunteers once more to help with the next phase of the plan. If you live or work near Slough, Berkshire (just West of London), please come and join us on Thursday 20 April 2017 to make an important contribution to the creation of a valuable environmental asset for the community. You'll not only be helping a good cause, you'll also have fun and meet new people! The work to be undertaken at the Jubilee Riverside Centre includes the creation of a new garden, the continued clearance of litter from the site, and potentially painting and decorating inside (if the weather is bad). There will also be the opportunity to join an ecological survey of the site, possibly by river, to consider signage and other information that would make the visitor experience more appealing. Equipment will be supplied to volunteers, and you will also be provided with lunch and other refreshments! Previous volunteers from the Environment Agency and DWP had an enjoyable and hugely rewarding time back in February. 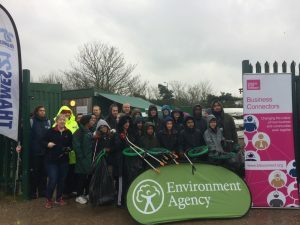 They braved the colder weather and worked alongside a range of volunteers from elsewhere in the community, from university students, Business in the Community representatives, to schoolchildren from Slough and Eton College and other local residents. One volunteer said: "It's great be able to make a difference like this. I've really enjoyed getting my hands dirty, and doing something very different from my day job!" As you can see from the picture, it was something of a typical February day in England. Hopefully the weather will be warmer in April, and volunteers might get a chance to enjoy some sunshine! 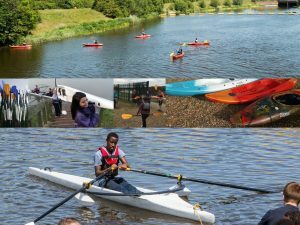 Not only is this work helping to create a site that can be used for both recreational and educational activities, but the first Jubilee Riverside Festival is planned for July. This promises to be a hugely exciting community event, but will be dependent upon the continued efforts of volunteers. If you are interested in getting involved, please contact us to secure your place.